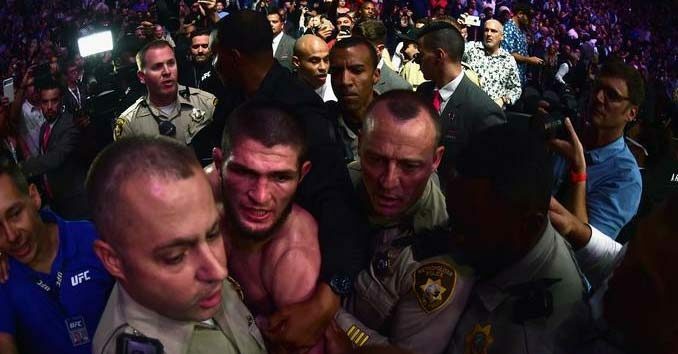 If you’re still one of the few people out there that believe the so-called brawl after the Khabib Nurmagomedov and Conor McGregor UFC fights in Las Vegas was real, today the Nevada Athletic Commission’s decision should prove the UFC has become as fake and scripted as the WWE. Today, The Nevada Athletic Commission officially announced they are suspending UFC fighters Khabib Nurmagomedov and Conor McGregor for a — wait for it — whopping TEN DAYS! Nevada Athletic Commission executive Bob Bennett says letters were sent Wednesday informing both fighters they’ll be suspended for ten days, effective Oct. 15. WOW — Ten whole days for fighters that are not scheduled to fight anytime this year. UFC put an entire arena full of people at risk by pulling this crap, and now nobody is going to be held responsible for multiple assaults, fights that spilled out into the lobby of the T-Mobile center, and a stunt that could have easily kicked off rioting throughout the Las Vegas Strip. Of course none of this was actually real; it’s all about sucking people into buying the next WWE style fight. Dana White is going to use the post-match ‘brawl’ to sell the next fight. Just hours after the fight, McGregor was already tweeting about the rematch. If the brawl after the fight was real, why has nobody gone to jail for multiple criminal acts, trying to incite a riot, fighting with police officers in the audience, and a list of a hundred other charges any normal person would have been hit with. Dana White and UFC’s new owners have sunk to a new low, and someone should be asking The Nevada Athletic Commission and Las Vegas Metro why they aren’t taking this more seriously! Does Las Vegas really need this? Shouldn’t someone at UFC be held responsible?